She was off birthday-ing. And now she's done being annoying by talking about herself in the third person and is ready to write this post. Seriously, sorry for dropping off; as always, I love your comments and couldn't wait to make some time to answer them. And the questions you kindly addressed? I will address those. Then you can address my addressing and it will be like one of those infinity mirror bathrooms, which is what Fair Finley gets caught in when she says sorry for saying sorry. Fair Finley: The Wilfair has over 100 employees, so they don't observe birthdays, generally. Fair's family does, of course, but she isn't into over-the-top parties, since those remind her of work and weddings, really. Her parents might give her a meaningful charm or book. Her brothers will draw her a picture and try to stay out of trouble for the day. The Overboves: Monty will go out with some of his movie friends on his day. Gomery will go out with Monty. Their moms will make them dinner, too; it isn't all club sandwiches all the time. Both guys like books as gifts, and Monty likes DVDs. I think if you got Gomery this for his birthday he wouldn't hate it. Sutton Von Hunt: Like Fair, she likes doing for her birthday, not getting; she probably slumber parties over at the hotel. She'll wear a plastic tiara, too, from the drugstore. Grandma frames a beautiful photo for her, too, and Sutton's mom, who travels a lot, tries to get back into town the week of. Her dad sends a card and maybe a gift certificate to a local restaurant. Prior Yates: He'll get 6,000 cards, baked goods, and homemade gifts from fans. Wil and Bo Finley: They'd love to go swimming in the motel pool for their birthday, but that hasn't happened. Yet. Fair spoils her little brothers though, with small gifts, as do Mr. and Mrs. Finley. They always get a big cake made in The Wilfair's kitchen, too. Thurs Mathers: No one sees him on his birthday. Maybe not even the World's Sexiest Aunts. 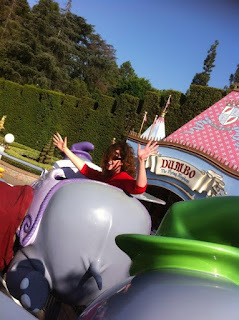 I know I'm not a big sharer of self photos, but this picture symbolizes my nearly unquenchable obsession with whimsy, cheer, and flying pachyderms. I might as well be upfront about that. Hands in the air, party people! Nice to read about everybody's birthdays :) I feel kinds sad for Thurs, I think we should go and keep him company on his next birthday. Thanks, Chiara! I love my birthday and getting older and never mourn the passing of time. Just glad to still be here on earth.